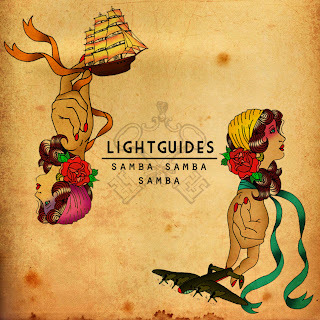 LightGuides could quite feasibly be yours and everyone's favourite new band if their debut EP 'Samba Samba Samba' falls into the right hands and gets played to the right ears. Having recently become the latest signing to the ever impressive Alcopop! 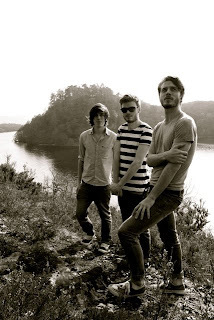 Records, this three-piece from Glasgow have already achieved national press in RockSound and Big Cheese, and this Summer played a 12 date tour with new label buddies Jumping Ships. If you can get passed the almost redundant comparisons with Biffy Clyro, yeah they are Scottish rockers too, then you might well be pleasantly surprised with this confident and enterprising debut EP. It's a record that demands your attention from the off, with 'Warhorse' shining in it's melodic greatness, beefed up with odd time signatures and those pesky angular guitars we'd almost forgotten about. It finishes in emphatic style leaving you wondering quite where the album can go next. Fortunately 'The Arts Factory' arrives with yet more of the same. The tempo is slightly slower which only goes to shine the spotlight on Mark Cowan's infectious vocals, with his Scottish accent somehow adding a sense of meaning and believability to LightGuides music, something which is often lacking in other emo bands (yeah, emo) from other parts of the world. 'Old Buckets Seats' is playful and made straight for radio, whereas 'Bachelor Death Party' ticks many boxes including a possible cheeky mid set mosh (yeah, mosh). 'W.H.Y.L' closes this 7-track EP in quite brilliant style, starting off slow, thoughtful, and retrospective, before finishing with a bang, full of optimism and hope (there's even pinch harmonics!). 'Samba Samba Samba' is a record that will put a smile on your face when you're feeling down, get you in the mood to go out and party, or even for those times when you need to reflect. It's an all encompassing album from a band who clearly have the talents and the mindset to reach as many heads and hearts as they please. With a 2nd EP to follow before the sure to be eagerly awaited full length album, be sure to keep both ears and eyes on this band in the future.